USB MIDI Interface using usb cable. Driver-less install in windows, will check Linux/MacOSX. USB MIDI seems to work with IOS devices using the media connection kit. Also you can use a USB->MIDI adapter and use the Hardware MIDI socket. 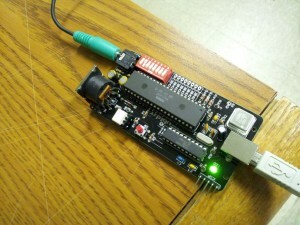 Hardware MIDI IN Interface using MIDI DIN socket. No MIDI OUT for device chaining. USB Streaming interface, I have an app that streams .ym files at the moment, but its a simple register dump so essentially one could implement tracker support. Still working on the firmware updater, but hopefully I can get this working and push updates to the firmware. MIDI — Volume and Pitchbend are supported. Velocity can be enabled and is simulated as volume, but otherwised ignored. Pitchbend is calculated on the fly so it should bend from + or – 1 full note. MIDI notes down to 18hz (I’d have to double check) are supported. YM Specifics such as envelope effects and noise control are implemented as CC commands. With the latest revision, 1 channel is on the left, 1 is on the right, and 1 is center. There is a jumper to enable mono output as well. Right now multiple USB devices can be used as separate channels, but I’m trying to think of a better solution for adding more channels. When will it be available ? Soon hopefully, I’m still working on some minor details, and sourcing parts and documentation. Let me know if there is anything else I can comment on. The (re)Birth of a synth! I decided to dust off a project that I’ve been working on-and-off for over a year now. Just to introduce it really fast… I’m taking a vintage sound generation chip, the YM2149F or AY-3-8910 and giving it a modern upgrade. First thing I did was see how hard it would be to add a MIDI interface to it. I was able to create a USB MIDI stack, and map notes of the chip to MIDI notes, then I thought it would be cool to add hardware MIDI as well. I’ve created most of the things in the MIDI world to equivalents on the chip. Most of the noise generation and ADSR envelope filters are implemented as CC commands. Pitch-bend works, velocity is toggleable via DIP switch (and just really does a volume, I personally don’t like velocity implemented this way). And volume works. I’ve been able to use fruity loops to create some cool retro sounding music. Then it dawned on me that I didn’t even implement the most obvious feature! Streaming old chiptunes! With the help of The Leonard Homepage I used his open source emulation app to hack into my device and just stream the registers to the chip, producing really awesome music! I’m looking to make this a kit for other people to experience, so I was going over the assembly instructions last night. I need to work on documentation, some code fixes, and to order a buncha parts first so its not quite ready but… soon enough. I’ll see if I can throw a video up soon. 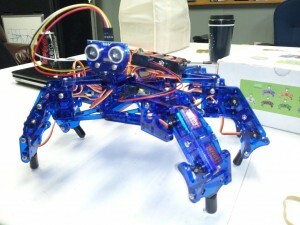 I got my Hexy the hexapod kit from the kickstarter finally, maybe 6 months late. Reasonable in kickstarter terms. Anyhoo I decided to put it together last night. The build process was pretty straight forward, however towards the end when you get into like mounting the battery pack / routing wires / etc things get a little sketchy. I guess my biggest gripe right now would be with the power, I need to order some lithium/nimh cells or do a custom battery pack or something. Alkalines aren’t goint to cut it. I was a little sad not to have gotten much movement out of it. I even hooked it up to my bench power supply but it maxxed it out at 3A and still just failed.